Childcraft Child Guidance Plan 1953 Ad. 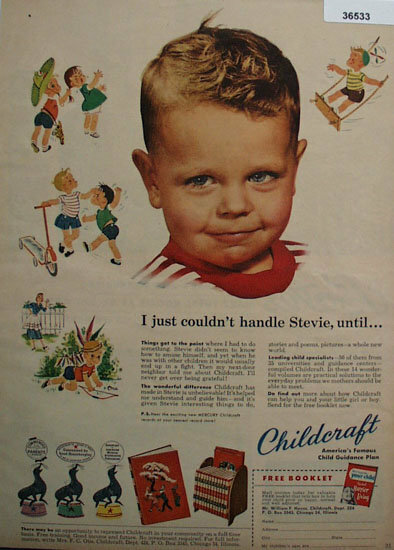 This color April,1953 ad states I just couldnt handle stevie, until my next door neighbor told me about Childcraft. Now Stevie has interesting things to do, stories and poems, pictures, a whole new world. Picture shows little boy. Also shows cartoon children playing and fighting. Also shows three seals doing balancing act. Magazine tear sheet picture is taken through plastic and may show wrinkles or crookedness that is not in the ad. This Original magazine tear sheet measures 7 3/4 inches wide by 10 3/4 inches tall. Items Similar To "Childcraft Child Guidance Plan 1953 Ad"